Muffin Tin Monday didn't have a theme this week. So we actually just used an everyday dinner for ours. 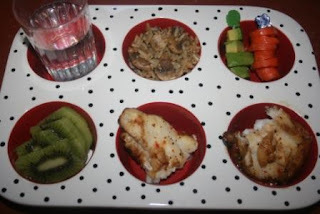 A glass of water, wild rice pilaf with extra mushrooms for Pierce, a skewer of avocado and carrots, a kiwi, and italian seasoned baked catfish. It went over pretty well. Except Pierce picked all the mushrooms out to eat from the rice and wouldn't touch the rice itself. Oh well. Congrats on your win! The fish looks awesome. We are trying to eat more fish at our house. Looks like a tasty dinner. I appreciate your Muffin Tin Monday.. Actually I look forward to seeing what you have on your blog.. My grandson, Ben is such a picky eater that your hints have been so helpful. He likes cut-up vege's and fruit that I make for him in shapes. I bought some miniture cookie cutters for stars , dogbones, and other shapes.. He seems to at least be interested in tasting some of these shapes.. I tell him to just taste it and if he doesn't like it ~ IT'S o.k. Thanks for all your help... You are tiggeriffic~! Super delish tin and congrats on the win, that's huge!! Looks good! I'm actually making catfish tonight. very cool! At least he mushrooms! My boys won't touch them! MMMmmm! Looks like a good lunch. Congrats on the DS too! I totally LOVE this muffin tin Monday thing. I am excited to see what new things you put in there. I need to get me some cute tins, I think my girls would respond really well to this! Love that muffin tin!! SO cute!